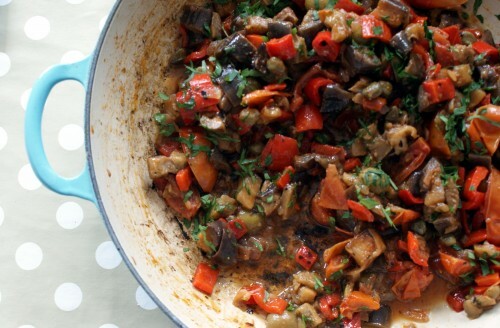 Caponata is made for the height of summer, when aubergines, peppers and tomatoes are at their best. While it’s not exactly summer yet, even though this weather is fooling us somewhat, there are some beautiful aubergines in Brixton market; if you can’t find nice ones, then save this recipe for August. Caponata is a Sicilian vegetable stew a bit like ratatouille but with a sourness from capers, olives and vinegar -it cuts through the oily richness of the stew perfectly. It’s best eaten at room temperature, scattered with any combination of basil, parsley and pine nuts and although Ottolenghi says you can eat it with pasta or couscous, I think it’s best on crisp slices of toast or maybe alongside a nice piece of monkfish. It’s also one of those fabulous dishes that improve with age; so if you can, make it the day before to give the flavours chance to mellow and mingle. Heat a generous glug of sunflower oil in a large frying pan and fry the aubergines for about 5 minutes, or until softened and golden (they don’t need to be completely soft). Remove them with a slotted spoon and transfer to a plate lined with kitchen paper. Sprinkle with a little salt. Repeat with the peppers, adding a little more oil if necessary. Try not to add too much oil as it will make the caponata too greasy. Fry the onions for 5 minutes, or until golden-brown. Stir in the harissa. Add the aubergines, peppers, tomatoes and vinegar and cook for about 10 minutes, or until the tomatoes have broken down and the aubergines and peppers are really soft. Stir in the olives and capers and leave to cool to room temperature. Check the seasoning and drizzle with a glug of olive oil.